In an attempt to ease neck and back pains that I started experiencing, I embarked on a mission to find something that would relieve me of such stress. Getting weekly massages sounded great but my pocket would surely suffer the consequences. So I opted for a less expensive yet effective way. Since I am always searching for products that can enhance my health and well being I knew there was a solution somewhere. I just needed to know where to look. 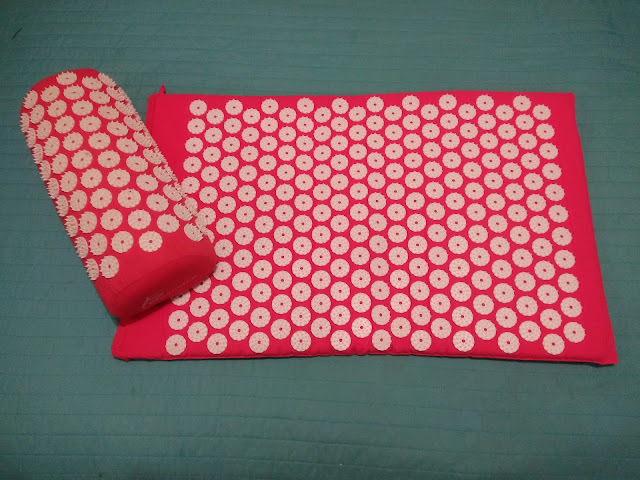 So I'm going to share my experience using an acupuncture mat. So I read up looked up electronic massagers. Massagers are actually a great solution for aching back and body pains so I bought one which was great but I needed something to really relax me. Something that would release tension and stress, something the electronic massager didn’t really do. I always heard how acupuncture was a great option for stress relief tension relief so I read up on its benefits. I found that there were many benefits including pressure points that can reduce fatigue, headaches, increase circulation and get rid of stiffness associated with stress. Eventually I came across such a product. It was called an acupuncture mat. It was an alternative to a real acupuncturist that can be quite costly. This was something you can do in the comfort of your own home at anytime you desired and the best part was, it is inexpensive. The acupuncture mat comes with a matching pillow. Each mat comes with over 6,000 acupressure points and measures 14.82x24.18 inches. When I first received mat I thought it looked very intimidating at first because of all the spikes, but when you get used to it you will wonder how you ever got along without it. At first I tried wearing a thin t-shirt to test out how it feels but I felt nothing. To really get to your pressure points it is best to be shirtless. It did hurt at first but after positioning my body just right the pain went away after two minutes. Afterward there was this unexpected relaxing pleasure that really eased my tension. I honestly couldn’t believe that it worked so well and at that point I was completely hooked. When you first start using it please ease yourself on to it slowly or you could end up injuring yourself. I started off using it for about 10-15 minutes a day then worked up to about 30 minutes with each use. The acupuncture mat can never replace a real acupuncturist but it is a really good inexpensive substitute. You can use it every day and just relax. Close your eyes and let the points energize and refresh you the way it did for me.